When it comes to Bangkok, one day is never enough. But that doesn’t mean you can’t have your own adventure in the city of angels. In fact, there’s a whole list of things to do, places to visit, and food to eat while visiting Bangkok! With a little help from Amari Watergate Bangkok‘s Amari Host, Pear, we’ve put together the pilot episode of Discover with Amari, your guide to the Bangkok riverside and things you’ll want to discover while visiting Krungthep. The day started off with a boat ride to Yodpiman River Walk, most famous for its flower market. A more recent addition to the Chaophraya community, this mall is designed with Old Siam in mind. There are a few interesting shops and stalls worth visiting here. Aside from an array of floral arrangements, you can also find Thai silk, crafts, and cool accessories. It’s a great stop if you’re looking for some quality souvenirs. You can also find a few restaurants here, but many only open for lunch and dinner. Since she had a few more stops to make, Pear decided to keeping exploring the riverside! Further down along the river is Tha Maharaj, one of Bangkok’s more popular lifestyle malls. Artistic and modern in its design, you’ll find many photo opportunities here. Conveniently located a walk away from Bangkok’s famous temples, right outside the mall you’ll find local shops selling Buddhist amulets and intricate wood carvings. The mall itself offers some shopping options too, but the main reason for Pear’s visit was to have a delicious lunch! Ros’Niyom (meaning “good tastes”) is stylised as a vintage, old Siam-style restaurant, serving classic Thai dishes. The menu has a range of items: rice or noodle dishes, spicy or rich flavours, and an impressive selection of sweets and drinks. Pear and her team were ready to fall into a food coma after lunch. But, the Bangkok adventure was far from over! One of Bangkok’s oldest and most awe-inspiring temples, Wat Pho is a favourite among travellers. Like many temples found by the Bangkok riverside, tourists and religious followers flock here on a daily basis, paying their respects and appreciating the beauty of the architecture and designs. This Buddhist temple complex is home to more than a thousand Buddha images, including the famous, giant Reclining Buddha statue. Wat Pho is perfect for explorers, photographers, and tourists who want to experience Bangkok culture and history. 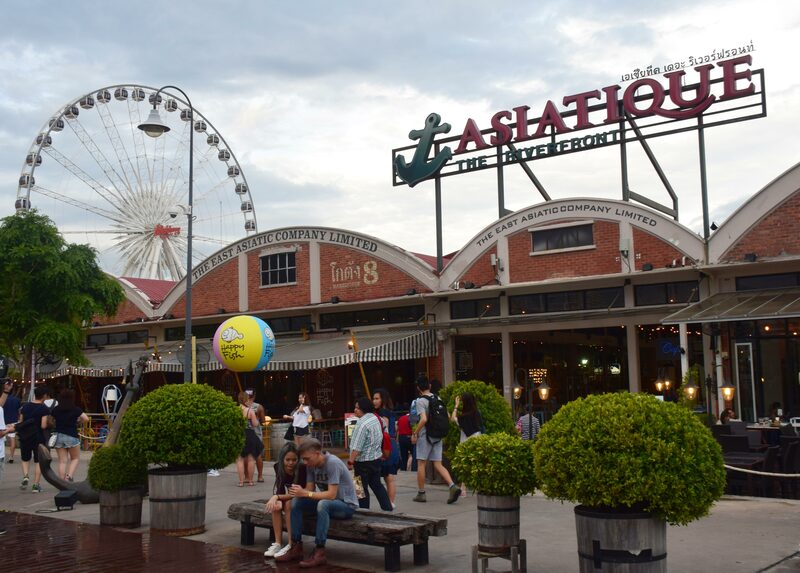 Her last stop of the day by the Bangkok riverside was Asiatique the Riverfront, extremely popular among tourists and locals alike. This huge lifestyle mall has more than a thousand shops and restaurants, and activities for the whole family. 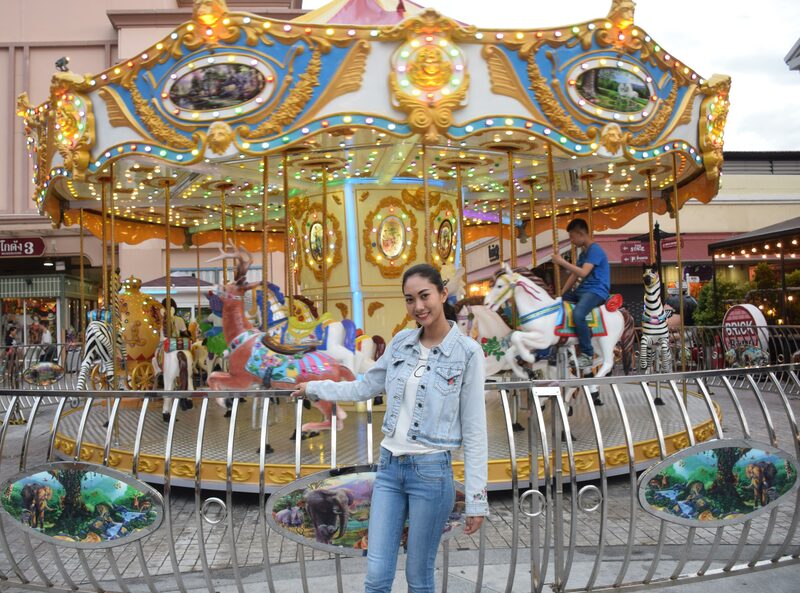 Attractions include the tallest ferris wheel in Bangkok, a small go-kart track, a merry-go-round, and other fun rides for kids and teens. If you’re looking for a fabulous show, the Calypso cabaret and the Joe Louis puppet theatre are also here! If you’ve got a different experience in mind, we have a whole website dedicated to where you’ll want to EAT, GO, SHOP and PLAY when staying with Amari Hotels here – check it out for our recommendations.